What can I say? This is a busy time in my life. What with Hawaii, moving, getting a kitten, starting back up with my business plans, plus working my regular job and just plain old living, the days (weeks, etc.) have gotten away from me. Just the other day a friend and I reminisced about the beginning of June. When exactly did it happen, anyway? Where is this year going? In the spirit of crazy, here are some delicious treats bobbing around on the internet for you to enjoy. Joy the Baker shared a maple blueberry syrup. I cannot wait for blueberry season to begin. 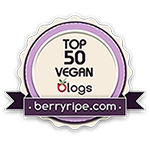 There's a recipe for a Triple Berry Parfait with vegan ice cream on Gluten Free Goddess' site that literally makes me drool every time I look at it. Literally. Every time. I'm allergic to mango, so can't add it, but I'd love to make this completely allergen-free dish with a different tropical fruit. I love love love ice cream, especially made with coconut milk, so I'm just about to go downstairs and make this chocolate chunk ice cream for myself (I suppose D can have some too, if he says please). I've always been leery of making noodles with zucchini squash, but this dish looks pretty easy and delicious, too.